With gorgeous vintage looks and great tones, this guitar packs old-school charm and modern appeal. Here's hoping it'll soon be part of a bigger range. Attention to historical details; overall build; sounds. Intonation might prove problematic with other string gauges. The Doublecut is a rockier proposition than its singlecut sibling. The split-diamond headstock motif is reminiscent of a Les Paul Custom. Launched in 1958, the Hollywood line offered the first solid electrics from German maker Framus and, like many others of the era, went for the Les Paul look, being small-bodied, single-cutaway six-strings. Equally in keeping with most of Gibson's competitors, Framus opted for semi-solid construction to help keep the weight down. Original Hollywoods shared the same styling but employed differing configurations of single-coils. Models 5/129, 5/131 and 5/132 featured one, two and three pickups respectively, while the 5/128 and 5/130 sported a novel single sliding unit. "The finish is to a high standard and the guitar's front features the company's classic black rose sunburst." Framus instruments first came into the UK via importers Dallas, but those brought here by rivals Besson bore that company's brand or its alternative Aristone logo. In 1961, keeping pace with changing guitar design trends, the Hollywood switched to a twin-cutaway shape and then by the mid-'60s the range had been phased out in favour of the more Fender-influenced Strato solids. Suiting their number-one status, the Hollywoods have been chosen as the basis for the first Framus Vintage six-strings introduced this year. As the name suggests, the guitars revive the original oldies, and, while it might've been nice to see the sliding single-coil or triple-pickup models again, Framus has sensibly opted for the more practical two-pickup 5/131, offered in both Singlecut and Doublecut form. Both 2011 models initially look to be pretty close copies but further inspection reveals a few changes, suggesting that the end results are intended more to evoke the character of the originals. That said, Framus has gone to considerable trouble to re-create some of the original key components and these undoubtedly enhance the individuality of these guitars. The slim Framus headstock stays true to Hollywood tradition, being Gibson-ish and sporting a split-diamond motif that strongly hints at the Les Paul Custom. The face also carries an accurate imitation of the classic Framus triangular metal truss-rod cover, complete with the company's distinctive globe logo. Tuners are repros of the original type and accordingly feature Framus-branded metal covers, although the cream plastic buttons are now more angular than oval. Like other Framus six-strings of the time, the original Hollywoods came with this maker's 'Stiletto' neck, which was certainly slimmer than many of the tree-trunk sized examples employed back then. The new model's glued-in length of mahogany is more finger-friendly, adopting meaty but manageable measurements. These contribute to a correspondingly big sound, while mainstream 'C' profile proportions play their part in an instantly easy playability. Essentially the same guitar as it's singlecut sibling apart from body shape, the twin-cutaway model accordingly shares many of its stablemate's features: the headstock and neck, the tuners, cosmetics and equally well-cut nut. The smooth rosewood fingerboard and frets are further common factors, although the former now boasts neatly installed, cream plastic binding that also extends around the headstock. As in the '60s, 21 frets are spread over a Gibson-style (628mm/24.75-inch) scale length, but they're bigger than before and finished to a very high standard. The number of position dots stays the same and they still stop at the 15th fret, as do the side markers. The Doublecut's styling comes closer to the original, although body depth is again slightly greater. Construction is another consistent aspect, comprising a semi-solid timber centre section that's faced front and back with plywood, but the extra cutaway decreases weight to a mere 2.5kg. The finish is to the same high standard and the guitar's front features the company's classic black rose sunburst, while all else is solid black. The thin black scratchplate is still metal, although the face now has a textured matt finish, rather than being smooth and shiny. An engraved large Framus logo is also present, though it's thicker than before. The simple, single-saddle metal bridge accurately apes the original design and intonation is surprisingly good and points to optimum positioning, which wasn't always the case on the earlier Hollywoods. Securely screwed to the body front, the square-edged short tailpiece is another model-specific piece of specially re-made metalwork. Two large single-coils look to be accurate repros of the originals; each is encased in a chromed metal housing that surrounds a bevelled plastic top containing six sizeable screw polepieces. The accompanying cream controls are yet more close-copy components, although the fluted knobs are now the push-on variety. Circuitry stays true to type, consisting of master volume plus separate bass and treble pots, while the four-way rotary selector provides all three pickup permutations and 'off', with the latter option usefully doubling as a killswitch. The Doublecut's different body shape has an effect on acoustic response, producing a toppier tonality with slightly less inherent resonance than its singlecut counterpart. When amp'd up, this contributes to a little more snap and attack, enhanced by a feathery edge to the higher frequencies. The bass control is very on or off in operation, thinning things out when only slightly turned back, but doing nothing discernible thereafter. In contrast, the tone pot decreases top end in a more gradual way, although even when fully off the results are far from woolly. Despite often losing out to Hofners in the popularity stakes, the original Hollywoods were a cut above a lot of the competition of the time and these recreations maintain the same emphasis on quality. There's little to choose between them in terms of playability and performance, but whether it's down to looks or some slightly edgier sounds, the Doublecut is the rockier of the two. Framus has put a lot of effort into ensuring that the build and components echo the originals and also improve on them where possible. The end results certainly reflect this degree of care, but these instruments are undeniably niche. There is some nostalgic appeal for older players, but they might remember the originals as lower-price electrics, and they can still be found for a lot less cash than the new equivalents. 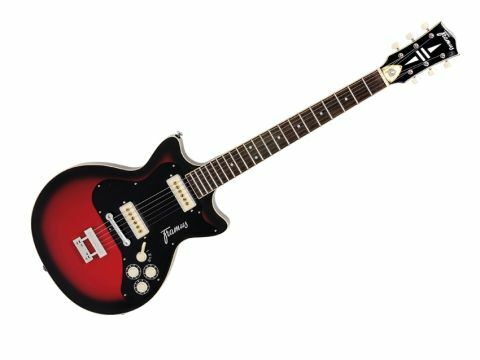 And so these new guitars should really be judged on their own merits: as distinctive instruments that offer an individual, retro-orientated take on looks and sound. Viewing the Hollywoods in this light makes them a far more appealing, and accordingly good value, proposition.